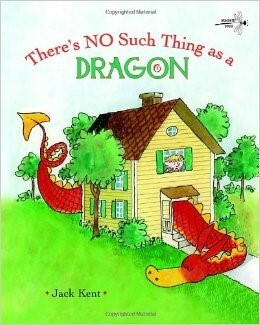 There's No Such Thing as a Dragon, by author and illustrator Jack Kent, is a little book first published in 1975. The story opens when Billy Bixbee finds a tiny dragon in his bedroom, his mom tells him, "There's no such thing as a dragon!" This only makes the dragon get bigger. He grows, and grows, and grows, until he's bigger than Billy's house—and that's just the beginning! When the book was published, the New York Times' review said, "This is without question one of the best -- and most original -- picture books in years." This book is the children's version of what happens when we ignore a problem's existence. As one reviewer said, "This book is a wonderful read-aloud companion to any teaching about emotion management, whether for adults or children. We all have emotions. When unacknowledged or handled poorly, these grow in power and affect all areas of life. We can all relate."